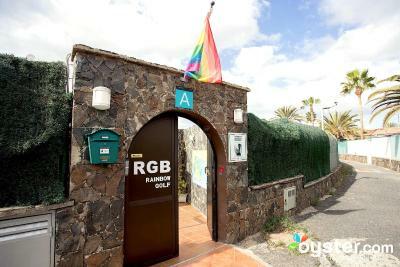 Lock in a great price for Rainbow Golf Bungalows, Gay Men-only Resort – rated 9.3 by recent guests! Everything else. The staff is super friendly and helpful. Spacious enough. Private and quiet. Rooms are clean and convinient. Nice TV. Wifi is weak but fine. Bed is alright. Lovely bungalow with two terraces, nice pool. Above all, excellent service, very professional and friendly, especially by Bartek: we will definitely come back! The staff are friendly and the layout of the resort is excellent. Great place and staff, the venue could be a great location for portrait photography or just to chill. All. The staff like family. The pool is nice temperature. Jacuzzi. Kitchenette equipped. Comfortable bed. Gorgeous outdoor. Fantastic clean comfortable bungalows, lovely clean pool area. Superb staff. Wouldn’t hesitate to return. Very much enjoyed my short stay here. Bungalow was immaculate. Cleaned daily and has pretty much anything you need. The staff were lovely and helpful. Overall, we were very satisfied with the complex - great accomodation, first class service, welcoming ambiance. Rainbow Golf Bungalows, Gay Men-only Resort This rating is a reflection of how the property compares to the industry standard when it comes to price, facilities and services available. It's based on a self-evaluation by the property. Use this rating to help choose your stay! 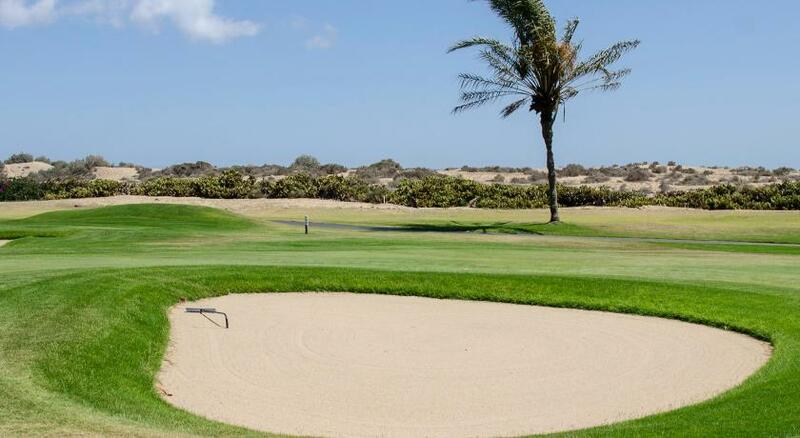 One of our top picks in Maspalomas.Rainbow Golf Bungalows, Gay Men-only Resort is in a quiet part of Maspalomas, 20 minutes' walk from the famous sand dunes. It offers an outdoor pool and free Wi-Fi zone. Each modern bungalow features a furnished terrace at the front and the back. The living room has a sofa and flat-screen TV with free satellite channels. There is a private bathroom with a shower, hairdryer and free toiletries. The kitchenette includes a fridge, microwave, ceramic hob and coffee maker. There is also a toaster and kettle. Safes are available to rent. You will receive a bottle of champagne and water on arrival. You can also purchase capsules for the coffee maker. Guests can use the hot tub and the infrared sauna for free. Free parking is available nearby and the complex is within 10 minutes' walk of the lively Yumbo Center. There is an on-site minimarket and a pool bar, where breakfast can be served. Services available include laundry and massage, as well as car rental. An airport shuttle service is available for an extra charge. 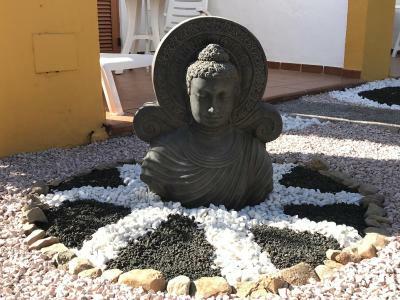 뀐 Located in the top-rated area in Maspalomas, this property has an excellent location score of 9.0! When would you like to stay at Rainbow Golf Bungalows, Gay Men-only Resort? Each modern bungalow features a furnished terrace. The living room has a sofa and flat-screen TV with free satellite channels. There is a private bathroom with a shower, hairdryer and free toiletries. 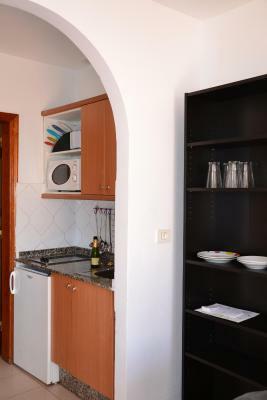 The kitchenette includes a fridge, microwave, ceramic hob and coffee maker. Safes are available to rent. Some bungalows have air conditioning and heating, available for an extra cost. This suite offers a extra large bed with memory foam mattress, and a large wardrobe with 5 mirror doors facing the bed. The lounge area features air conditioning/heating, and it comes with a sofa, a 48-inch flat-screen TV with 24-hour gay adult movies and a DVD player. A ceiling fan is also available. The modern kitchenette is equipped with a fridge and a coffee machine. Towels are changed every day, while bed linen is changed every other day. Pool towels are also provided. Featuring a terrace and air-conditioning/heating, this bungalow has a double bedroom and private bathroom. There is a modern kitchen and a seating area with sofa and flat-screen TV. Our main strategy is to ensure RESPECT as our major keyword. Every guest can do what he wants, but always respecting the Resort and the other guests. We are in a pedestrian area, free of noise from car or buses. Ideal to rest and to have fun too. House Rules Rainbow Golf Bungalows, Gay Men-only Resort takes special requests – add in the next step! Children older than 19 years are welcome. Rainbow Golf Bungalows, Gay Men-only Resort accepts these cards and reserves the right to temporarily hold an amount prior to arrival. Please inform Rainbow Golf Bungalows, Gay Men-only Resort of your expected arrival time in advance. You can use the Special Requests box when booking, or contact the property directly using the contact details in your confirmation. Perhaps the location to the beach is a bit remote but taxis are cheap, and there are buses. The sauna is not hot enough. The jacuzzi needs to be available after 7.
food Service would have been a nice addition. Unfortunately, food wasn't available at the bar as advertised due to some technical issues. I'm sure this is only a temporary glitch but meant we had to self-cater more than we'd planned. No plug next to bed to charge phone. No instructions on the sauna room. The timer display was unlit. There were no recycling bins and I felt sad that I had to put mixed waste in the same bin. There were no instructions how to use the coffee machine but I got Simon to demonstrate so it wasn't a problem. The staff were so friendly. The cleanliness of the complex was outstanding although I didn't notice who or when did the cleaning. My bungalow was spotless after the maids had been in. The food & bar were lovely. The gratis welcome pack of water and cava was a pleasant surprise. The staff is incredibly nice and friendly. Everywhere is clean. You really feel like your best friends. Jaccuzi was a bit too cold. very helpful and friendly staff, very clean place.